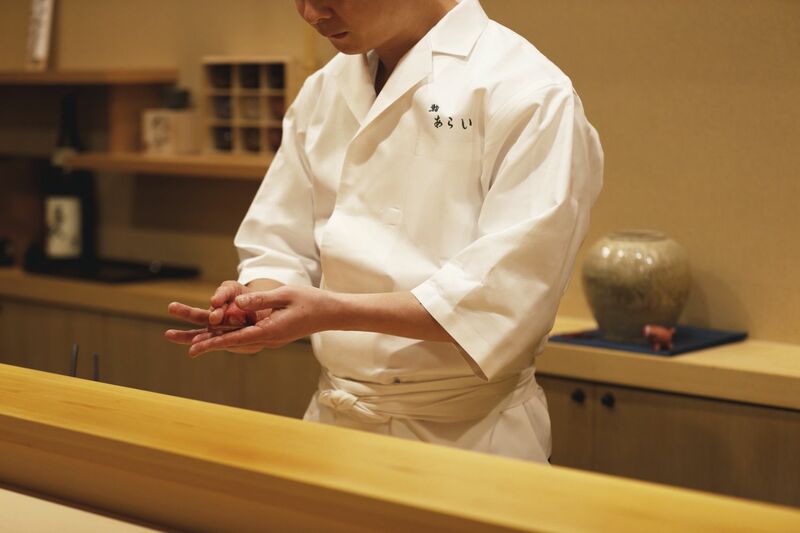 Despite being one of the youngest sushi chefs in town, Chef Arai has already forged his own style. 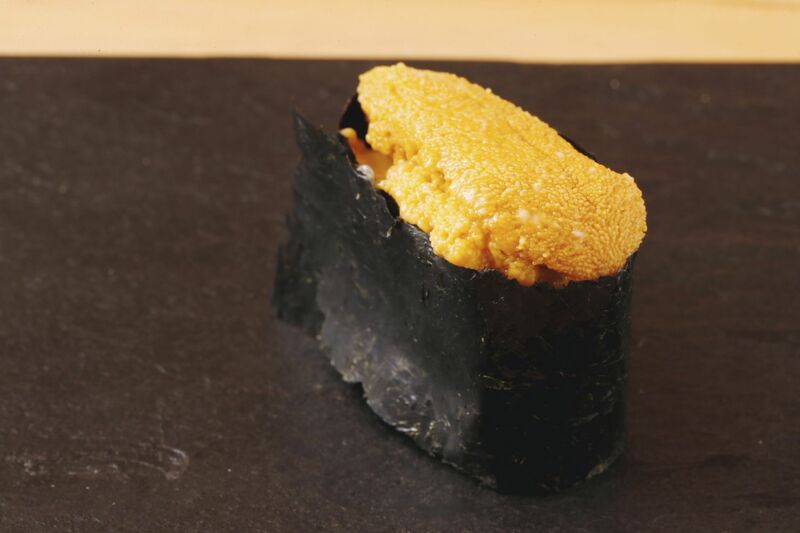 Newcomers and regulars alike love it, especially having a say in the line-up in their sushi course – a rarity in this age of omakase. 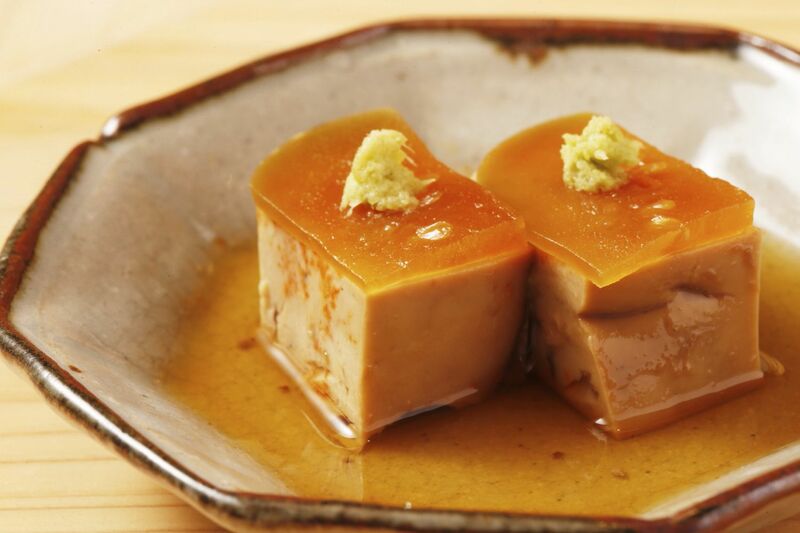 A most enjoyable sushi experience right in the heart of Ginza, the atmosphere at Sushi Arai is friendly and comfortable, even if you are dining solo. 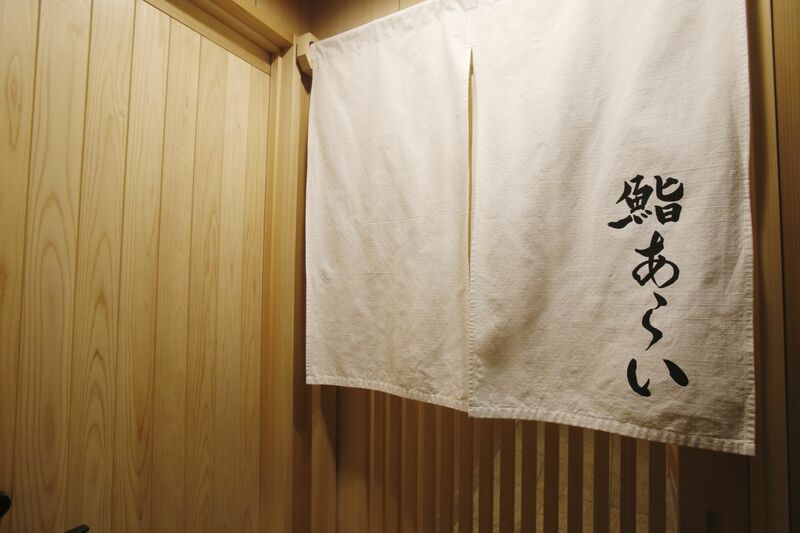 Stepping into Sushi Arai, it feels brand new with the clean, crisp smell of Kiso Valley hinoki. And yet there are touches that are throwbacks to sushi restaurants of old: a majestic ice box built into the rear wall and a row of handwritten wooden plates displaying the freshest fish each day. 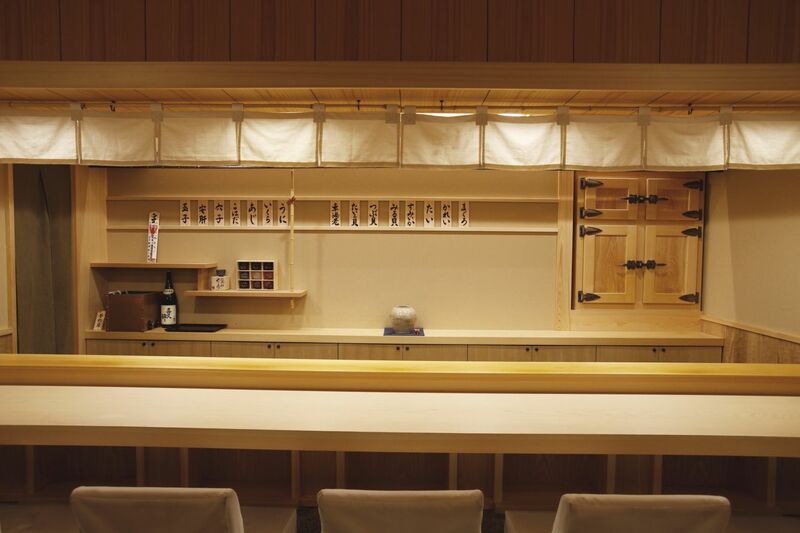 The chef stands behind the beautiful unvarnished seven-seat hinoki counter under soft lighting, pleased with the authentic atmosphere he has achieved. He is especially proud of the pot that has prize of place on the counter behind him. 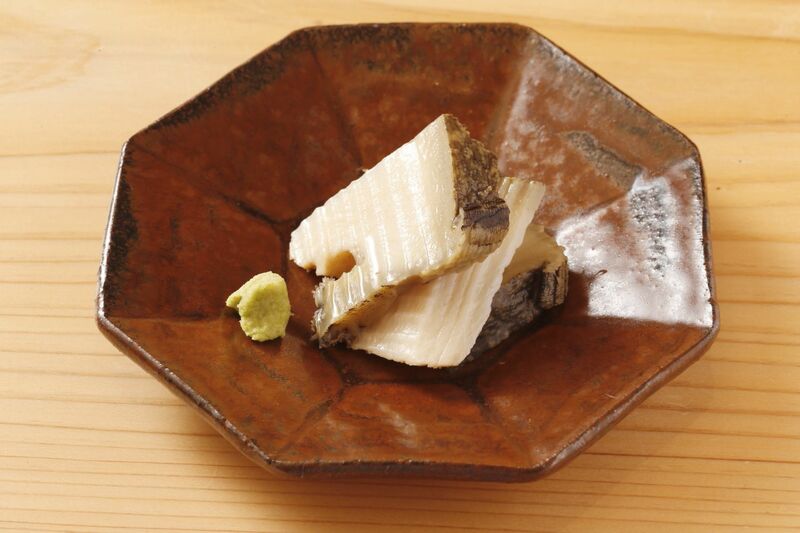 It was gifted to him to commemorate his restaurant opening, by the serious, classic Edomae sushi Chef Shimizu at Shimbashi Shimizu, whom Arai has long respected. Tucked away is an entirely private room that also seats seven people offering the perfect place to relax and deepen personal friendships or business relationships. 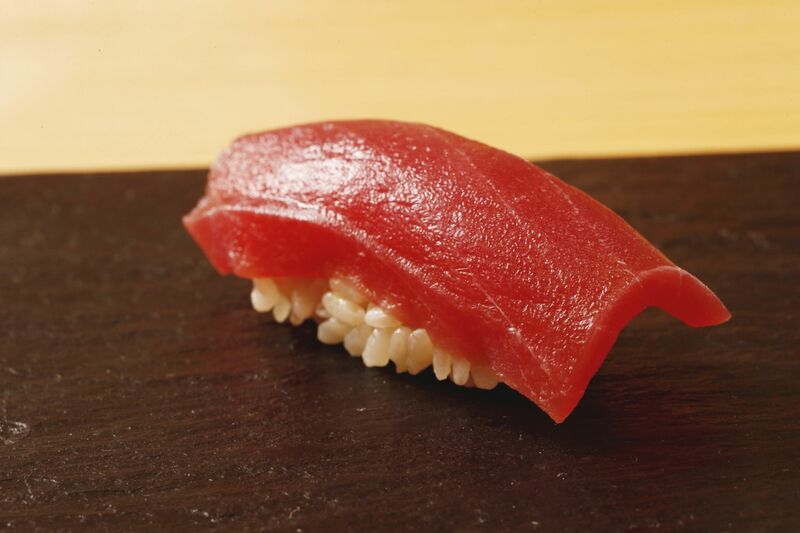 As the chef at a sushi restaurant, Chef Arai wants you to feel like you really ate your fill of sushi. And for this reason the pieces are slightly larger than most – another indication of the chef’s leaning to a more classic style. Nothing flashy, just genuinely delicious sushi. 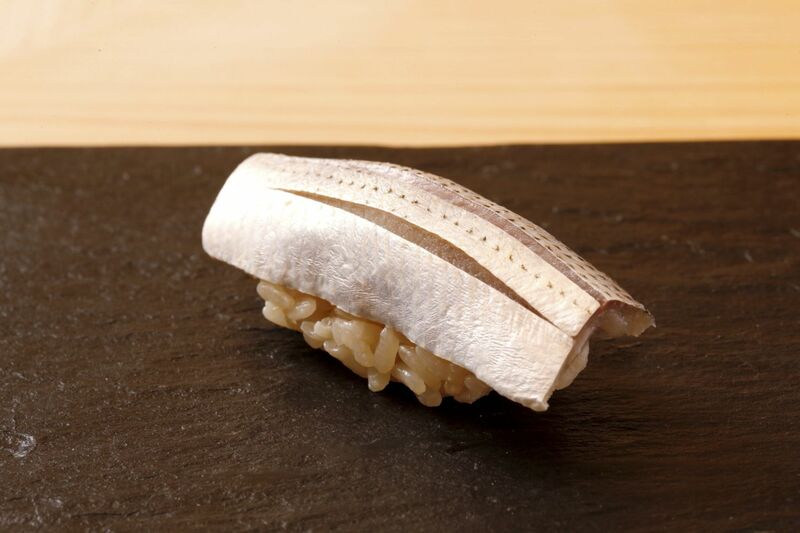 The focus here is on nigiri sushi in which tasty fish and shellfish slices are gently pressed on to a bed of delicately-flavored rice made with akazu red vinegar. And while the chef adjusts the amount of rice if people would like to drink more, he never compromises on the generous size of the ingredients that top the rice. It’s those kinds of details that make you feel really looked after. As does the fact that this chef likes flexibility and welcomes customer input in a style called okonomi, or ‘as you like’. Diverging from the more typical pattern of omakase where the sushi master determines all your sushi bites, Arai asks what and how you would like to eat. Because the most important thing is that the customer goes home happy. The lunchtime menu is all nigiri sushi chosen from the market-fresh fish selection displayed on wooden menu plates on the wall behind the chef. 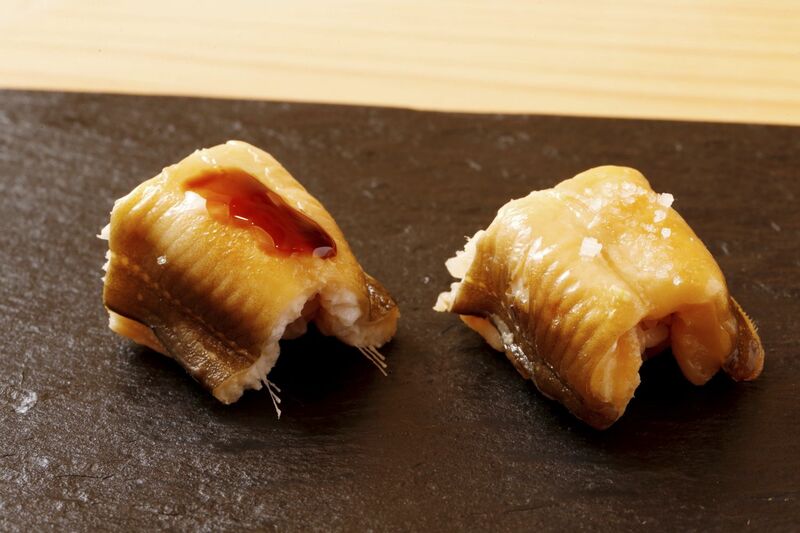 If you dine in the evenings, you will be served a delicious array of sushi, and you can also enjoy tsumami of abalone, simmered fish or a luscious piece of monkfish liver topped with a traditional Japanese pickle called narazuke. Chef Arai is completely unwavering in his belief that the sushi master should visit the market every day to select the best ingredients. The fishmongers simply won’t sell the best products to individuals they don’t have a relationship with. So you will find Arai at Tsukiji Market early every morning building those relationships and ensuring the best products are served to his customers each day: golden yellow sea urchin roe (uni), glistening silver gizzard shad (kohada), saltwater eel (anago) two ways, and not forgetting the many parts of the tuna like maguro and chutaro, among many others. Yuichi Arai is just 33 years old and originally from western Tokyo. 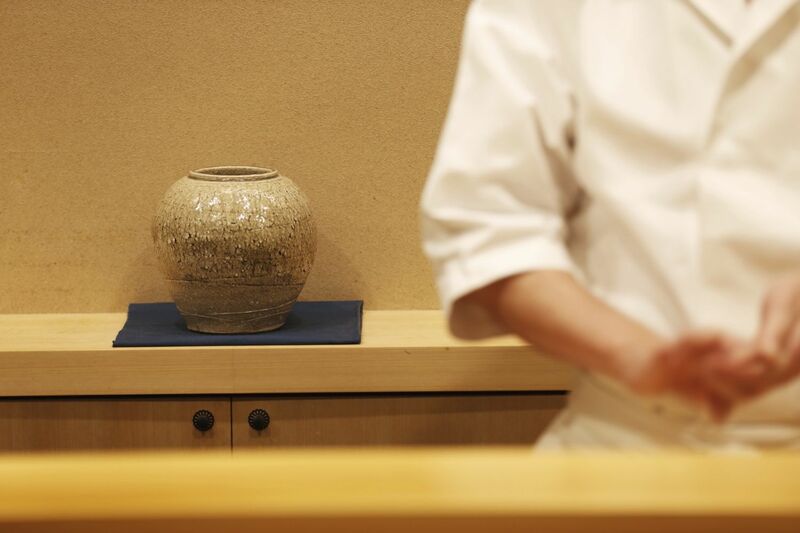 He opened his restaurant at the age of 32, and while that may sound young, he trained under other sushi masters for 15 years. Having gained his cooking license during high school, Arai began training at Kyubey immediately after graduating. He built his skills over eight years at the Kyubey locations in the Hotel Okura and Keio Plaza Hotel. This time shaped his more classic perspective on sushi. And the tough times there instilled in him the idea that young people should go through hard training to gain experience and maturity. Keen for more exposure, Arai took himself to an interview with Chef Nakazawa of Sushisho in Yotsuya. He ended up working under him for six years before departing on his dream journey of being the master of his own sushiya. 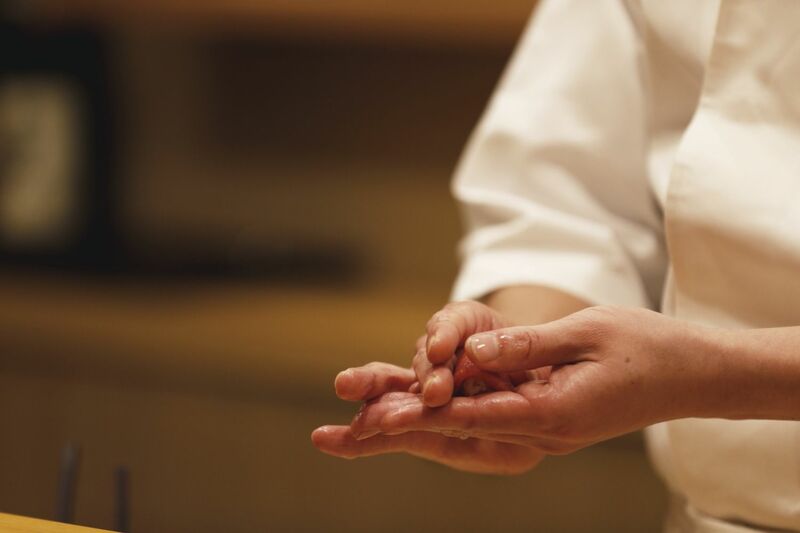 Chef Arai’s vision is first to make this foray as an independent sushi chef a success, while at the same time raising his apprentices to be the skilled and mature sushi chefs of the future. He finds many youth to be impatient and feels they need longer education under a master before they go out on their own. These two goals are large burdens to carry, so Chef Arai has decided to focus on them before thinking any further into the future. 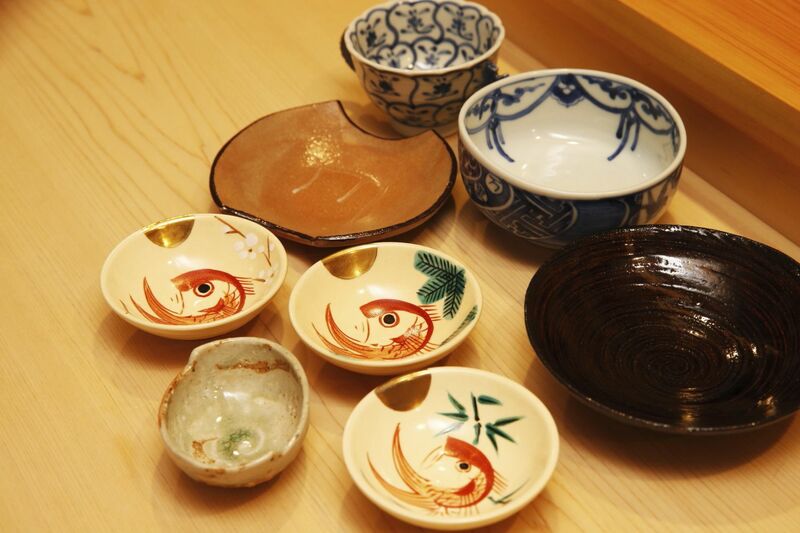 The tableware here has all been collected from Fukui Prefecture, each perfect for its role. The small round plates with a sea bream design and different seasonal motifs of sakura, bamboo and pine are especially lovely. Octagonal dishes in beige with a brown rim or a burnt red-brown hue that highlights the creamy color and decorative knife cuts of the abalone. 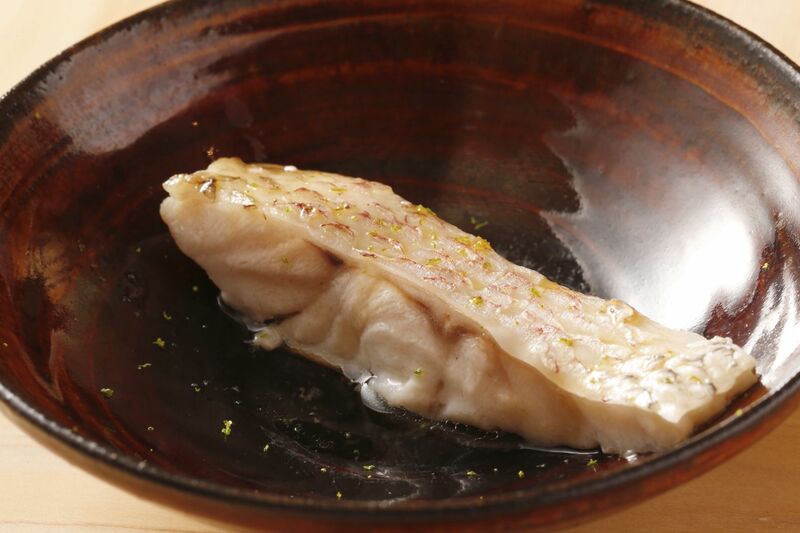 And a rich brown bowl just deep enough to hold the simmered fish, with a smooth edge perfect for sipping every last drop of the delicious dashi. 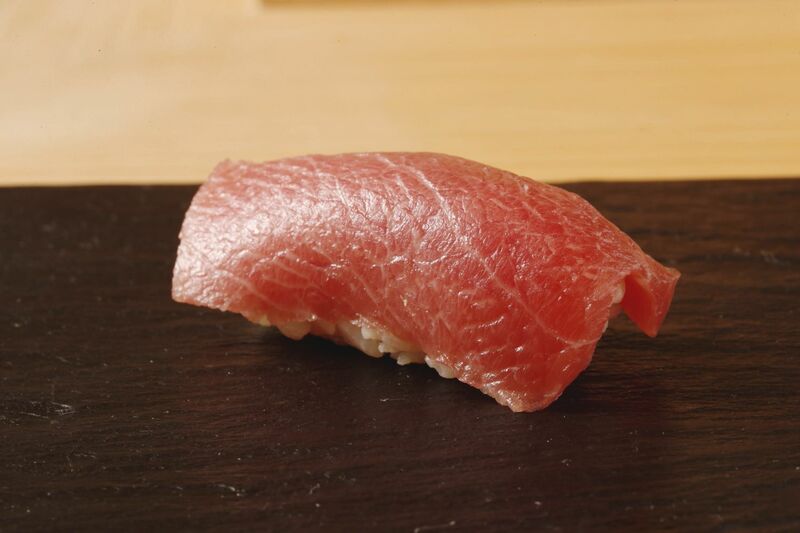 The colors and textures of the nigiri sushi, however, are best highlighted by the soft hinoki hues of the counter where Arai places them directly, one-by-one, just before you partake in them.